Thank you for your interest in the 2019 Writing The Future Scholarship. Please fill out the form completely and click the "Submit Application" button. You will be notified only if you are one of the finalists. At DiBella Law Offices, P.C., we're all about giving back to the community. From supporting our Boston Red Sox, to collecting holiday donations for charities, to performing random “Good Deeds” for local families in need, we're always looking for ways to make a difference. You're young, but it's never too soon to start helping others! Tell us about a good deed that you did or are currently doing for someone else. Tell us a story. Note: By submitting your application for this scholarship, you agree to use any potential scholarship award for educational purposes only, such as tuition or related expenses such as school supplies, books, course materials, school living expenses, etc. If you win the scholarship or are a finalist, we may share your essay and photo on our website and may use them for marketing purposes. 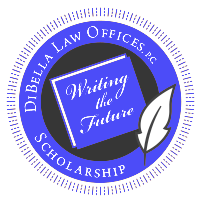 Copyright ©2019 DiBella Law Offices, P.C. - All Rights Reserved.